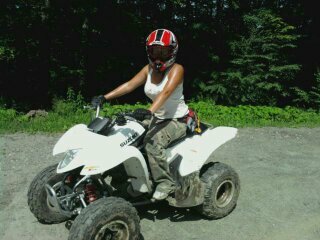 I had a sport quad once. I loved it. Then I sold it. I’m sad. I want another one. Till then, I’ll just look at hot girls, half naked on all four…wheels…. Come’on now! Focus! Awww....I miss my quad. We were such a perfect fit! 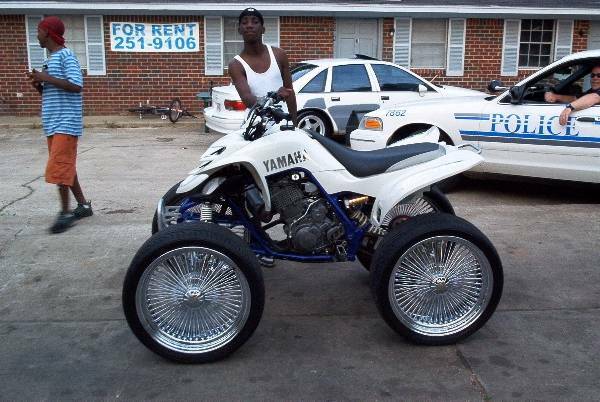 I don’t know that I could be riding around on my quad this half naked, but daaaaaaYUUUUUUMMMM! These girls make me wanna ride sumpin’ sumpin’…. Blond girls don’t usually grab my attention, but um… Holy Hotness! Ok, maybe it’s just her bikini top and what its holding that I really like. And there there is this… which, by the way was for sale on Craigslist. There are just so many funny things about this picture…. Haha!